She mentioned a special train. A secret train. An obscure, unscheduled, short, unpowered train, which travelled quietly from Harbin in Chinese Manchuria all the way to Vladivostok in Far East Russia, over four days. We wanted to do that trip. The previous year we’d travelled north from Vladivostok by bus. We’d gone up through the city of Ussuriysk and then into no-man’s-land on the Russian side of the border, the immigration processing centre. Vladivostok mayor: Free port status will create 50,000 jobs in first 5 years! I recall we sent a text message to Sue Burgess who was at the time at the Australian Embassy in Moscow, after finally getting through the border and she simply replied "Thank God, you’re out of my area". That’s another story, remind me to tell you about it some time. I’ll also tell you about the four-day jail sentence. On that trip, when we finally got to Suifenhe we went to the railway station to start the normal trip to Harbin. There we spoke briefly to a lady conductor. It was she who first piqued our curiosity about the secret Harbin-Vladivostok train. No-one we asked in Harbin had ever heard of it. Not even the knowledgeable staff at Harbin railway station could help, and that railway station is a huge and busy place. We went into Sherlock Holmes mode. Working in Harbin gave us lots of contacts there but despite these, no-one we asked could help. We even talked to Professor Sui who’d grown up there and had been there now for fifty years. He knew nothing about such a train. "Even if there was one, why the hell would you want to do it?" Finally, we spoke to Ivan. He’d been a student in Harbin for many years and had some insights into Russian-Chinese connections. With Ivan’s help we got a hotel’s telephone number. That telephone number led to a "Chinese-Russian travel agent". We finally found the hotel and tucked away around the corner from its reception desk where guests rarely go to a half-sized office. The woman in there purported to be a Chinese travel agent. The next day, with the help of Rose (thanks Rose) and the Hadar photocopier of Professor Jung, we had colour copies of our passports. The day after that we had the tickets. On a hot Saturday night around 9pm we fought our way into the station rooms and it seemed like 40,000 other people were using that entrance at the same time. We first had to negotiate the security check, which is a large screening machine fed by a conveyor belt carrying luggage. Placing our bags onto the belt should have been easy. I remember being pushed and shoved near the belt. I remember being yelled at by people around me. I finally remember doing some pushing myself. What price progress? Finally we were into the waiting room and there were people everywhere. No seats. We sat on our suitcases and they sat on theirs. There was a wonderful smell of chilly and noodles in the air, men asleep across benches, women juggling infants, groups of young people carrying small parcels. Several people were carrying large parcels. One parcel was the size of a 42-inch television set. We waited for 10:30pm in the heat and the hubbub. When we got through the barrier everything changed. The platform was strangely empty given the squeeze in the waiting room and this train looked like any other in the night. The problem was that none of the carriage numbers matched our tickets. We walked and walked, checking numbers all the time and worrying about the creeping departure time. At the far end of the train, at the rear end, stood a strange person. All the other conductors were female, and Chinese, in grey uniforms. 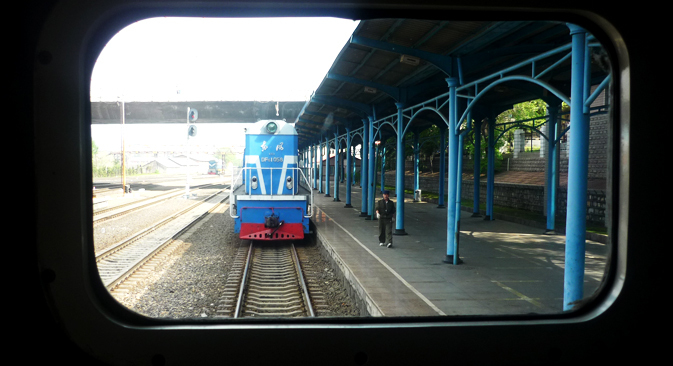 This strange person, standing right at the end of the platform, was male, in a blue uniform, and at attention, he was definitely not Chinese: Alexander, our проводник (railway conductor). On board we sought out our compartment. On other trips, like Beijing to Harbin or Harbin to Blagoveshchensk there was always a bunfight for cabins, despite the fact that they’re numbered. Even if you find your cabin in a reasonable time, there’s a bunfight for a bed. Strangely, that didn’t happen here. We walked right along the narrow corridor unaccompanied and we had a choice of bed or seat in any empty compartment. No matter how long we waited, even when the departure time came and the train silently slipped away from the station, no-one was there to jostle with. It finally dawned. We were alone. These were two German-made but Russian-owned carriages, tacked numberless onto the end of the standard Chinese train going to Suifenhe. There were exactly two provodnitsas (Alexander and Marina). Amazingly, it had exactly and only two passengers also: us. I swear within just a few minutes of departure, Alexander was out of his uniform and into a much more sensible tracksuit bottom and black T-shirt. Marina wore jeans and a wrap. They were happy the train was rolling. We were happy too, to be rolling into the night, knowing that these two cars went all the way to Vladivostok no matter what the rest of the train did. Within a few minutes the four of us were trying to hold a conversation. At that time we knew just a few words in Russian: правда, да, нет, спасибо (true, yes, no, thank you) so it was not easy. Despite that crazy attempt we knew we liked each other. Alexander and Marina were pleased to have two passengers. We were pleased to have such friendly and helpful hosts. We relaxed. We looked out at the Harbin night. The samovar boiled, we drank coffee. The train stopped briefly at several places, but its main stop was at Suifenhe. We had to do nothing but watch while our two special carriages were removed and shunted. The main train terminated at Suifenhe, but our carriages were bound for the immigration processing centre at Grodekovo. With the train stopped at Suifenhe we had reasonable internet access, using a local SIM card in our phones. We’d used it to stay in touch with Sergey a few times too, by email. He was working in Moscow in the Foreign Office by then, so we hadn’t seen him for some time, but he was and is a great friend. Sergey warned us. "What are you going to do at Grodekovo?" "It’s a very small place. I know, I’ve been there, and your train stays there for 8 hours!" "What about we catch a cab from there?" "I don’t think it’s a good idea." So, we were resigned to waiting at Grodekovo. When our train stopped there we watched all the travellers on the Chinese part of the train getting off, each one carrying a number of bags. Most were carrying several parcels too and I smiled as I saw that there were many with parcels the size of the 42-inch television set I’d see before. We waited. Why hurry, we’re going to be here for 8 hours anyway? A knock at our carriage door. A Russian woman. Blue uniform, serious, stylish, carrying a walkie-talkie. A crooked finger: "follow me". We followed her along and between the tracks. I can remember what she looked like from behind. When we arrived at the main building it looked like we had to join the hundreds of other passengers in a long wait for the immigration booth. Not so. Our blue stylish guide took us straight in, parting the crowd with the walkie-talkie as she went. We were in the booth for one minute. "Welcome to Russia". Then she chaperoned us out the other side and through the outer station doors. Two people were waiting for us there, Elena and Mikhail, Sergey’s parents. We found out soon enough that Sergey had called them from Moscow and they had driven 120 km north from Ussuriysk to pick us up! Elena had not spoken English since she was in school, and she carried a cheat sheet of common phrases with her. The four of us travelled back together through the 120 km of Far East forest and into Ussuriysk. The train we left behind, with Alexander and Marina on it, waited for the 8 hours in Grodekovo, then it rolled over similar country, arriving at Ussuriysk station that evening. We shared a meal in town and then spent some time at Elena and Mikhail’s house. Tourism is great and eating out and experiencing new things are excellent too, but nothing beats meeting and sharing at a table with friends in a foreign country. We simply gave Marina’s mobile telephone number to Elena and she easily found out where the train was parked at Ussuriysk station. Mikhail and Elena dropped us off there at about 10pm. We slept. Early the next morning we arrived at Vladivostok’s famous railway station. This time on a cool and rainy day. The hardest part of any story is what to leave out. Remind me to tell you about the Rocks Cocktail Bar there, the table tennis, shashlik on the nuclear beach. Sometime.